We’d love your help. Let us know what’s wrong with this preview of Moonlighter by R.A. Crawford. When the most famous woman in the Universe goes missing, the PULSE Council summons every ship under their command to find her. Captain Zara and her elite crew must take the Moonlighter on a heart-pounding journey across the stars, risking life and limb to find her. Stella, the ship’s newest and only Human crewmember, is still reeling from her torturous Trial. She must overc When the most famous woman in the Universe goes missing, the PULSE Council summons every ship under their command to find her. Captain Zara and her elite crew must take the Moonlighter on a heart-pounding journey across the stars, risking life and limb to find her. Stella, the ship’s newest and only Human crewmember, is still reeling from her torturous Trial. She must overcome her fears or risk losing her entire career – and maybe even her life, all while discovering just how alien her new crewmates really are. To ask other readers questions about Moonlighter, please sign up. I received a free ecopy of this book from the author in exchange for an honest review. The best-of-the-best crew of Moonlighter, the most cutting-edge ship in the PULSE fleet, has been tasked with locating a missing woman, the most important woman in the entire universe. Captain Zara and her crew will risk it all to bring her home. Stella, the newest addition to the crew and the only Human on-board, is still recovering from her grueling Trial. She has a lot to learn or she may end up losing her p I received a free ecopy of this book from the author in exchange for an honest review. The best-of-the-best crew of Moonlighter, the most cutting-edge ship in the PULSE fleet, has been tasked with locating a missing woman, the most important woman in the entire universe. Captain Zara and her crew will risk it all to bring her home. Stella, the newest addition to the crew and the only Human on-board, is still recovering from her grueling Trial. She has a lot to learn or she may end up losing her posting because the Moonlighter only accepts the best PUSLE has to offer. She's also going to have to come to terms with just how alien her fellow crewmates really are. Even though the Moonlighter and it's crew are the best of the best, this mission just might turn out to be too much for even them. I'm so thrilled to be back in the world of PULSE. I read book one at the beginning of 2017 and I absolutely adored it. If you like, you can check out my review of book one, The Trial, here. Thanks again to R.A. Crawford to giving me this opportunity! 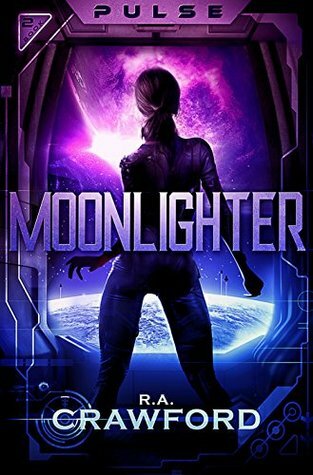 Anyway, the second book in the PULSE series, Moonlighter, takes up immediately after the intense thrill ride that was The Trial. The sequel really changes the game and I loved every second of it. We're still following Stella every step of the way, but this time we're thrown into an entirely new setting with an all new alien cast of characters. We get to see a lot more of the interstellar PULSE universe than what we got to glimpse in book one. Just like before I loved getting a good look at, through Stella's eyes, our broad cast. Each member of the crew really gets their moment to shine. How all of these different alien species have come together to work together on the ship and get things done is fascinating, although there may be a little friction here and there. I particularly enjoyed getting to know Rao sisters, one of whom is the most well-known PULSE soldiers and the other has been assigned to work with Stella. Finally, I also want to mention just how great the author is a writing action scenes in this series. It's all very visual and I was really on the edge of my seat quite a few time. Overall, I highly recommend the PULSEseries. I'm so thrilled to have had the opportunity to try both of the novels in the series so far, The Trial and Moonlighter. It's definitely set the tone for my wonderful reading year. This novel ends well, but I would love to come back to this universe some day. I'm looking forward to R.A. Crawford's future projects. Thanks again! I received this copy from the author in exchange for an honest review. Thanks! This is the second book in the series. A universe where everyone are women and humans are the redneck cousins no one wants to visit. We continue with Stella's story as she joins the universe's version of the Police called the Pulse. I really liked the first book and it made me cry but I found it too heavy on the action and a little wordy. This book I think has a much better balance. It is still action packed and I Crawford writes some of the best action scenes out there. The only person I can th This is the second book in the series. A universe where everyone are women and humans are the redneck cousins no one wants to visit. We continue with Stella's story as she joins the universe's version of the Police called the Pulse. I really liked the first book and it made me cry but I found it too heavy on the action and a little wordy. This book I think has a much better balance. It is still action packed and I Crawford writes some of the best action scenes out there. The only person I can think of who is better is Illona Andrews. So quite a compliment. But there is also the relationship part as we follow Stella trying to figure out a new job where nothing really makes sense. Everyone thinks she is inferior and either insults her or underestimates her. All the while she is dealing with the death of her best friend who was more of a sister and having to pretend she wanted all of this all along. We get to meet a whole new cast of characters. This time we are given time to fall in love with them as they are working with Stella instead of her direct competition. Also the violence here because it has real world consequences to the characters seems much more realistic than throwing away lives in a test. This time they are risking their lives to save others which I find much more noble. There is very much a Dr Who type of vibe to the missions the women have to face. Crossed with a zombie apocalypse set on the mars colony in Total Recall. Personally I would have left off the last chapter. It is really an epilogue and brings us back to some of the characters from the first book. I would have just left it with the girls sharing secrets and gifts at the end and that would have allowed for another book. With the epilogue it feels like this is a duology but I would have liked another story with the teams. The cover of this book is brilliant. Clever to do the black silhouettes. The colours are awesome. I always like a good cover. The 2nd instalment of the Pulse series is just as gripping as the 1st book. I didn't want to put it down. I couldn't wait to find out what had happened to Stella. This second book develops her character and introduces new characters who are all interesting and work together as a team of pretty invincible females, with an intriguing plot twist. PULSE: Moonlighter is a great continuation to the series that - although it tells a very different kind of story to the first, maintains the style and tone that R.A. Crawford gave us in the first installment of the series. Whereas the PULSE: The Trial told only told us a small part about the world that existed within this series, this book expands our view of the world by introducing us to several other types of characters from vastly different backgrounds than we saw with Stella and the other hu PULSE: Moonlighter is a great continuation to the series that - although it tells a very different kind of story to the first, maintains the style and tone that R.A. Crawford gave us in the first installment of the series. Whereas the PULSE: The Trial told only told us a small part about the world that existed within this series, this book expands our view of the world by introducing us to several other types of characters from vastly different backgrounds than we saw with Stella and the other humans. PULSE is definitely a book series to keep an eye on. Ever since I finished reading PULSE: The Trial, I have been waiting for the sequel, and PULSE: Moonlighter does not disappoint. Action, Humour, Adventure, it has it all and with a great cast to boot. Seeing what was next for Stella was great but the new characters stole the show in this book, I loved them all. One of the biggest strengths of PULSE: The Trial in my opinion was the action scenes and R.A. Crawford shows he hasn't lost his talents PULSE is definitely a book series to keep an eye on. Ever since I finished reading PULSE: The Trial, I have been waiting for the sequel, and PULSE: Moonlighter does not disappoint. Action, Humour, Adventure, it has it all and with a great cast to boot. Seeing what was next for Stella was great but the new characters stole the show in this book, I loved them all. One of the biggest strengths of PULSE: The Trial in my opinion was the action scenes and R.A. Crawford shows he hasn't lost his talents for this as the action in Moonlighter are bigger and better. I can't wait for more stories in the PULSE series! After finishing the first book and being blown away, I couldn't wait for the next instalment, and I wasn't disappointed. It dived straight into the action with brand new characters that I couldn't wait to know more about. This book introduced us to a variety of alien life forms, all of whom I loved; especially the funny ones. It was nice to have the injection of humour interspersed amongst Stella's grief and the tense action scenes. I could not put it down and I cannot wait for the next book! R.A. Crawford has always been a big time sci-fi and fantasy fan. Most of his childhood was earnestly consumed by weekend-long Final Fantasy marathons, movies he certainly wasn’t old enough to watch, and books borrowed but never returned to the local library. After years of procrastination and despite working full-time his passion for rich space opera and high fantasy storytelling led him to finally put pen to paper on his debut novel. The resultant book, PULSE: The Trial, is the first in a series of books centered around an all-female galactic society. Having never quite grown out of Star Wars novels, Star trek episodes, Green Lantern comic books and Final Fantasy video games Ryan currently rested in Surrey - UK where, along with his wife, he embarks on the journey of teaching his two children why Gimli is the best character in LOTR.